NOSTALGIA IS ALL ABOUT RELIABILITY! Above image from this site! When we were in school, Reliance was starting to make its mark, Only Vimal was its imagination capturing slogan! What was Reliance all about? Was it quality? Good marketing? Image building? Reliance was, as its name indicates, all about RELIABILITY (or trust). 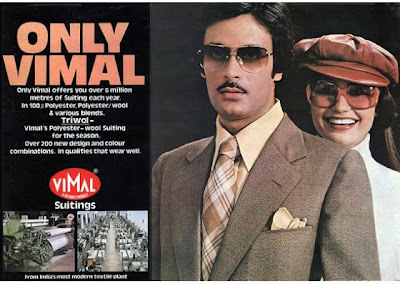 Customers were confident of its high quality fabric - Vimal, customers were also offered good service at exclusive showrooms with its wide range of fabrics, shareholders were happy with its ever growing share value, dividends and bonus shares; traders enjoyed doing business with Reliance; bureaucrats and politicians were pleased with the relationship management practices of Reliance (they have dedicated personnel to manage relations with key bureaucrats and politicians) ... Hence, all associates found Reliance to be reliable. Clearly, the key of success was RELIABILITY, for Reliance. Many summers back, when I had just started my career and field work, I happened to meet up with a senior MR from Wockhardt during field work. While conversing we were discussing the reasons why doctors patronized brands. His tip for field success was simple: BE RELIABLE! Yes it was trustworthiness or reliability along with other inputs that provided the key link to success - there is no compromise with reliability! The senior MR elaborated: when you are regular with doctor calls, the doctor gets a feeling that the company, brands and the MR are reliable. When you gain confidence of the doctor, when the doctor feels the pharma company or MR is reliable - it makes success happen!! Everyone is ready to provide sponsorships to doctors for various clinical reasons, however, the one who is most reliable is the one who gets the maximum mind share and prescription share or even the chance to sponsor a thing or two for the doctor. I recollect one more incident: this was when I served as a first-line manager for South Karnataka: A doctor whom we met in an interior of South Kanara district, was peeved. He was hurt by the fact that a senior MR of another big company had not provided a rechargeable lamp along with the goods purchased, as promised by the senior MR. The doctor was upset that a senior MR whom he thought to be reliable had "dumped" goods on him, on a false promise of a gift. The doctor was hurt with the apparent breach of trust. Reliability was the key question here, it was not just about the gift!! This goes to show how reliability makes a great difference, in customer management and brand success. One of the important secrets of success of most senior MRs during my field working time, was their reliability. The senior MRs were trusted for their quality of communication and their regular field activity. It was this image of reliability that created success for most pharma companies. During my independent field work in Bangalore in the 1990s, one of the elderly lady Govt. doctor's in Kadugodi (then an ex-station of Bangalore! ), requested for some extra samples of Metacin, Cinaryl etc for personal use. I took her home address (located some where in R T Nagar, mind you I was new to Bangalore field work, searched for her house, and left the samples at her residence, the same evening!). The next month, I was surprised to find a good amount of prescriptions in favour of my products, she said, she was happy that I was reliable. This incident brought out the full force of reliability (to me) in pharma business. Today, too, the means of communicating reliability may be myriad, however, reliability of the brand promise, and reliability of the value delivery mechanism of a firm remain the main reasons of success. Being reliable is the foundation for market success. Regularity (of pharma field work) definitely provides the perceived value of reliability. Besides regular field work, constant creative communication inputs that reiterate SAFETY, EFFICACY, PURITY, CONCERN FOR THE CUSTOMER, VALUE DELIVERY, INNOVATION AND AVAILABILITY create the image of reliability. Communication inputs that refurbish testimonials from doctors, depict images of various certificates earned by the firm (like ISO 22000 etc), the appeal and quality of the communication and marketing inputs - all these enhance the perception of reliability of a pharma firm. Reliability - which is an emotion (a sense of trust) - ensures business. Conversely, low perception of reliability and any breach of contract that reflects poor reliability - is the main reason for, loss of business. Building reliability requires understanding market expectations and those of all stakeholders. One should constantly enquire: what the customer or prospects want - for a firm to be classified as reliable. Once the RELIABILITY AUDIT is done the points that generate reliability need to be built in to the pharma enterprise's functioning. Building reliability in to the processes of a pharma enterprise is a continuous affair. For eg., Auto companies are doing that continuously with new models of cars, innovations, customer feedbacks that are then incorporated in to the car and retailing formats, phone surveys and high quality after-sales service. It is these concepts that can be migrated in to pharma enterprise functioning to keep oneself as the most reliable. Today, MNCs are creating various marketing formats for engineering higher perceived value of reliability. While GSK has put together a community pharmacy team to service pharma retailers, Pfizer has launched a continuous series of RETAILER MEETS through their MRs, where education programs for pharmacists (on their products and on patient counselling concepts) are held frequently at various towns and villages. This has helped create a new market demand creating force for Pfizer. Pharmacists now hold Pfizer in high esteem! Futuristic and aggressive pharma firms like Glenmark are using enabling IT systems and processes for improving field force effectiveness and value delivery to doctors, this has in turn helped such companies improve their image as a reliable firm. IT and mobile telephony has helped improve communication, this has made work more efficient, such improvements have finally increased appeal of reliability of pharma firms. When a doctor finds a product best-in-class, of good quality, assured availability, sees that his or her patients are happy with the product performance; when the prescriber is happy with the presentation of the product-MR-company-communication inputs-complimentaries-sponsorships, then the reliability factor rises up! Better the reliability, improved are the pharma firm's fortunes. Hence, the question each pharma manager should ask himself and try and seek answers or solutions for: ARE WE PERCEIVED AS HIGHLY RELIABLE BY THE TARGET MARKET SEGMENTS? Reliability is not just for the customers. VENDORS, bankers, regulators, traders, service providers, investors, employees, other associates and the general society - all have "reliability requirements". A pharma firm that meets many of the reliability requirements of most stakeholders, through best practices, will find growth in corporate image, brand equity, sales, market share and good ROI (return on investment). It is this reliability focused functioning that has taken firms like Google, Make My Trip, Intel, Marriott, AND CLARIS LIFESCIENCES (the only pharma company) in the 2011 list as the best places to work for! This is a truly great achievement for Claris, since even biggie pharma firms like DRL, Cipla and Abbott have not made it to the list!! Thanks for reading this blogpost, please scroll down, read all other blogposts, please click on older posts when required, kindly recommend this blog to your acquaintances.